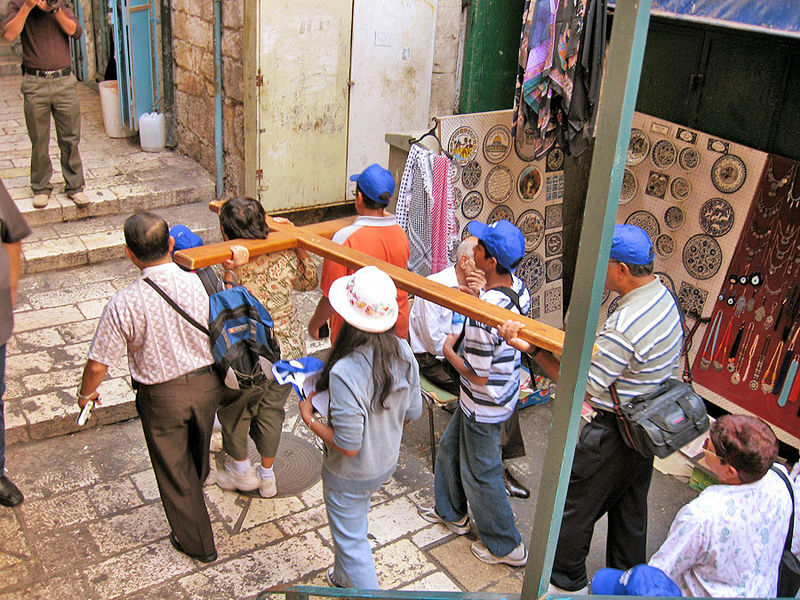 For many Christian pilgrims to Jerusalem, the most important and meaningful thing they will do while in the city is walk the Via Dolorosa, the route that Jesus took between his condemnation by Pilate and his crucifixion and burial. Via Dolorosa ("Way of Grief" in Latin) is a road in the old city of Jerusalem , a path where Jesus was lead in agony, carrying the crucifixion cross. There are a total of 14 stations along this path, based on events that occurred on the way to the Golgotha hill, the site of crucifixion, which is located at the Church of the Holy Sepulcher. Eight stations are marked along the old city road, while 6 additional stations are places in the compound of the church. Via Dolorosa is located within the old city of Jerusalem. It starts from the place where he was tried and convicted - near the Lions' gate on the eastern side (Muslim quarter). It ends in the crucifixion place, Golgotha, where the Church of the Holy Sepulcher is located in the west side of the old city (Christian quarter). The tour is an easy walk and should take a few hours up to half a day. Is important to mention that along the route above are scattered some fascinating historical sites, some are connected directed to the way of grief and some simply are worth a visit. We recommend you wander around and investigate for yourself the attractions on the way. You should know that each of the 14 Stations of the Cross along the Via Dolorosa is marked with a plaque, but these small signs can be difficult to spot. Probably the best way to be sure of recognizing all the stations is to join the Friday procession or a guided walk (ask at the Christian Information Centre). If you can manage to come on a Friday- you're in for a treat. 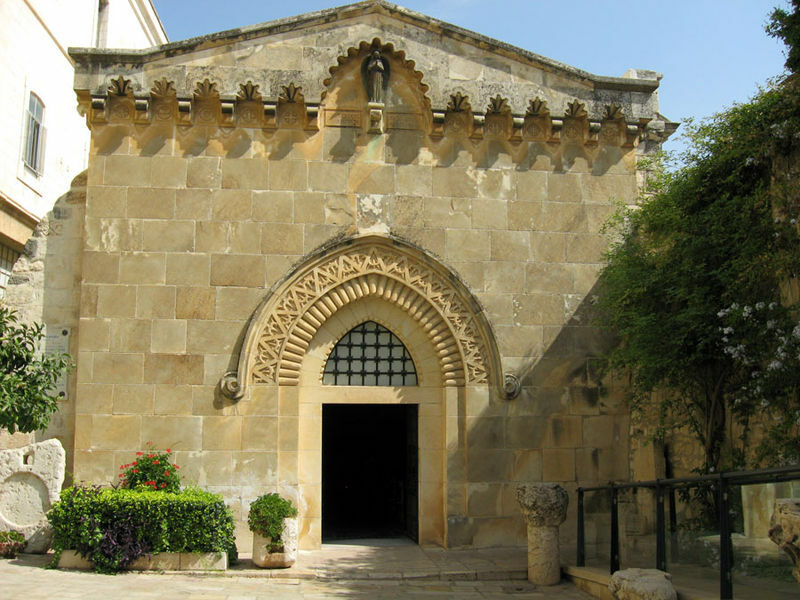 Each Friday, a Roman Catholic procession walks the Via Dolorosa route, starting out at the monastic complex by the first station; the procession is organized by the Franciscans of this monastery, who also lead the procession. Acted re-enactments also regularly take place on the route, ranging from amateur productions with, for example, soldiers wearing plastic helmets and vivid red polyester wraps, to more professional drama with historically accurate clothing and props. It is true that a person can reconstruct the road that Jesus took almost anywhere in the world. After all, a panting of the 14 stations is very common in Catholic Churches, so the believers can walk it true in there minds. Bat the reel thing is in Jerusalem, and there lies the true experience. 1. Jesus is condemned to death, based on the New Testament. 2. Jesus is given his cross, according to the Christian tradition Jesus was whipped here. 3. Jesus falls the first time. The station was built with the aid of catholic Polish solders in 1947. 5. Simon of Cyrene carries the cross. There is a small socket in the wall were Jesus leaned. 6. Veronica wipes the face of Jesus. They say that the handkerchief is in the Vatican since 707. 8. Jesus meets the daughters of Jerusalem. "Daughters of Jerusalem do not weep for me; weep for yourselves and for your children". Luke 23:27-2 8. 9. Jesus falls the third time. 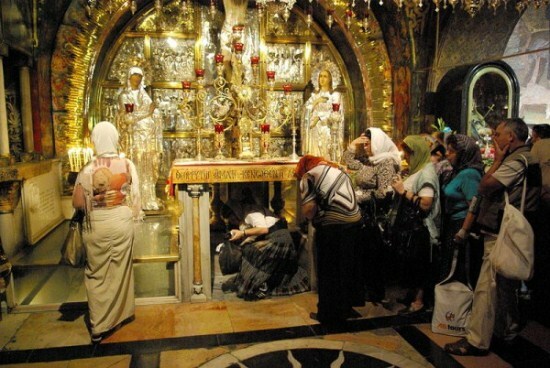 The place where Christ's body collapsed yet again under the weight of the cross. 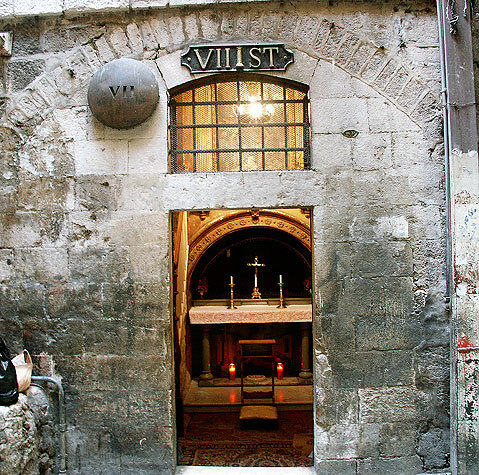 The remaining five stations (10th to 14th) are located inside the Church of the Holy Sepulcher. 11. Crucifixion: Jesus is nailed to the cross. 12. Jesus dies on the cross . 13. Jesus' body is removed from the cross (Deposition or Lamentation). 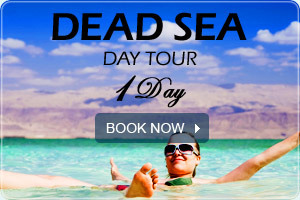 Click here for booking this tour! For more tours in the Old City of Jerusalem, please visit our Jerusalem Tours section. 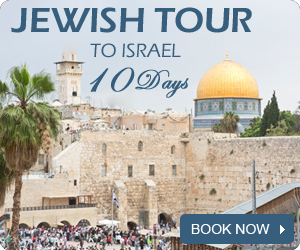 If you are looking for a christian tour in Israel, check our Israel Christian Tours with the best tour guides in Israel.